This weekend, it was announced that Kingdom Hearts III will be released in 2018 and feature a Toy Story world. In the most recent Weekly Famitsu and on Famitsu.com, KHIII director Tetsuya Nomura revealed how Toy Story finally came to Kingdom Hearts. As Kotaku previously reported, longtime Kingdom Hearts director Tai Yasue told us in 2012 his dream world would be Toy Story. Likewise, Nomura has long wanted Toy Story to come to KH. When Nomura wrote the plot, he was working with the assumption that it was going to be set between Toy Story 1 and Toy Story 2. That changed, however. “Finally, it turned into a story that’s set after 2.” So this world is set between the second and the third Toy Story films. “For me, because I wanted to put this world into [Kingdom Hearts] since KHII, I am deeply moved that it’s actually happened,” Nomura told Famitsu. 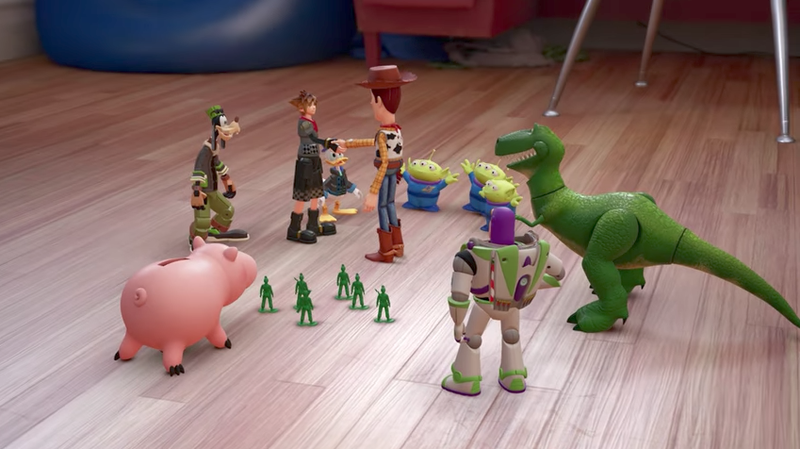 Nomura added felt a Toy Story world was “absolutely necessary” for Kingdom Hearts III and explained that he began talking about the possibility of doing something with Toy Story while making the first Kingdom Hearts! So, for example, when Pixar’s John Lasseter came to Japan, Nomura met with him to discuss this. Lasseter asked him how he planned to bring Toy Story to KH, and Nomura explained his vision. Years later, it finally happened. “It’s taken a long time,” Nomura told Famitsu, with a chuckle. Hey, the same is true of Kingdom Hearts III.